It is hard not to be weary of spin-off movies in that they seem like quick cash grabs where there is no possible way a fair amount of thought or development was put into creating it. They simply exist to mine the potential of more money from something that was previously successful and has a distant link to the latest product. 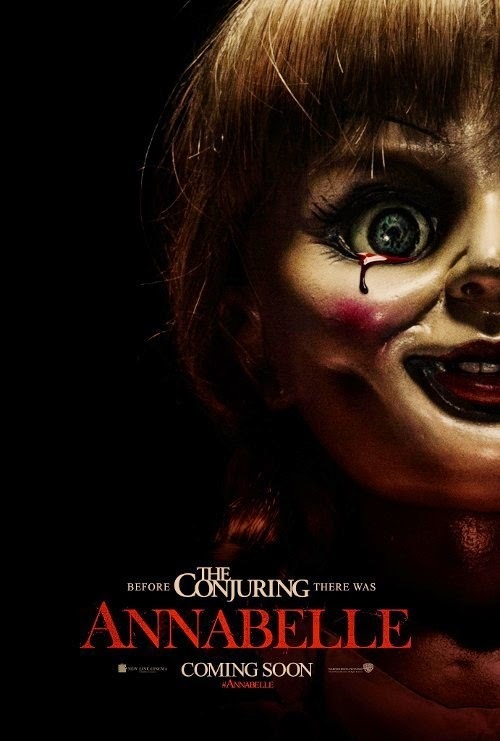 Annabelle seems a perfect example of this as The Conjuring barely came out a year ago and introduced us only slightly to the title character here and now we already have a full trailer after the teaser dropped just over a month ago. The teaser was effective in that it was minimal (much in the vein of the first Conjuring trailer). This second clip from the film gives us more insight into the plot of the film and more of an idea of what we can expect story-wise. The film looks to have the same visual style and tone as one of James Wan's horror films, but John R. Leonetti has taken over directing duties here after serving as DP on The Conjuring. While overall, this looks to hit many of the familiar beats of demonic possession films the hook is that we all wanted to know more about this scary little doll after her curse was put on hold by Ed and Lorraine Warren. I actually enjoyed Wan's sequel to Insidious last year more than The Conjuring, but am still interested in this because I like the type of horror utilized in his movies and it looks like that has been mimicked well here. I wish they wouldn't have given away some of the scares we see in the trailer, but hopefully that means they have a good amount left up their sleeves. Annabelle stars Annabelle Wallis, Ward Horton, Alfre Woodard and opens on October 3rd.